In early July 2010, exotic, invasive Asian longhorned beetles were discovered in six Red maple trees at the Faulkner Hospital in Jamaica Plain, a neighborhood of Boston. Jamaica Plain is right on the outskirts of the Neponset River Watershed. As soon as the beetles were identified, the trees were removed, to prevent further spread of the longhorned beetles. Then, hundreds of trees in the Arnold Arboretum across the street were surveyed for Asian longhorned beetles. Fortunately, none were found. The public is being asked to keep an eye out for Asian longhorned beetles. Please lend a hand! 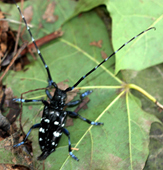 Boost your Asian longhorned beetle knowledge. Left: Egg-laying site. 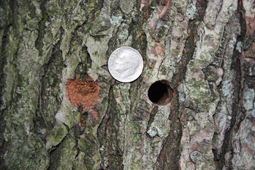 Right: Exit hole of adult. Top: fresh egg site. Bottom: site >= 1 yr. old.